So let’s say that you’ve bought a new chainsaw and now you want to keep it in tip top shape. After all it was expensive, so you don’t want to have to replace it if you can avoid it. 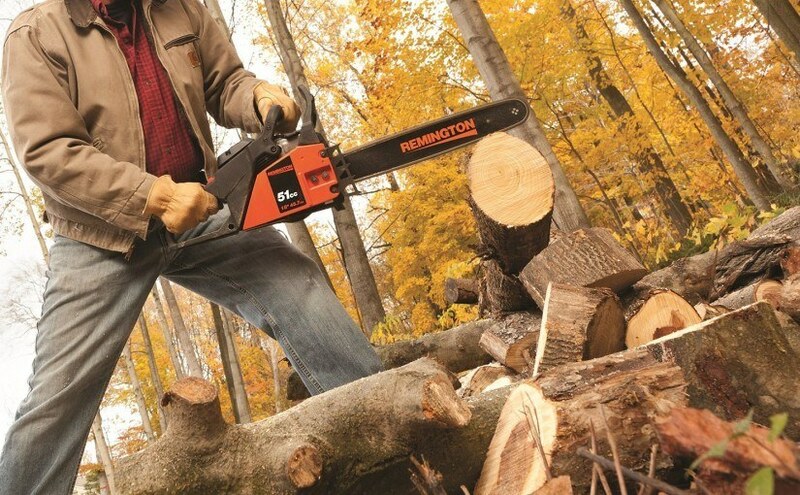 How much maintenance you need to do depends on what type of chainsaw you bought and the features it has. If you bought an electric saw and it has an auto oiler, then you’re laughing; the only thing you’ll probably need to do is to keep the blade sharp along with topping it up with chain saw oil. Don’t skimp here, you’ve just paid out some serious money for your saw and you want to use premium oil to make sure it keeps running for ever. One way to test that the auto-oiler is working is by pointing the chain bar at something you don’t mind getting oily (like a cardboard sheet) and revving the engine; you should see oil spatters appear. If you’ve got a gas powered chain saw then you’ve got a little more work cut out for you as you’ll need to look after the motor. If you’re paying attention when using your saw then you’ll get some hints when there are issues. If it’s particularly difficult to start then you could have a bad spark plug or stale gas. Alternatively if you lose power at full throttle it could have a dirty filter or a clogged exhaust. Of course, the best place to find information about keeping your saw in perfect condition is the user manual. This will have information about all the things you should be looking at and, more importantly, all the stuff you shouldn’t touch. Remember, some of this tool should only be messed with by a qualified mechanic. You’ll need to keep your wits about you and don’t be afraid to stop. If you’re not comfortable doing something, then you probably shouldn’t do it. Find a qualified person and see if they’ll let you watch; then maybe you’ll be confident enough to do it next time. A petrol chain saw is a mini-engine; and it needs to breath. It draws air in, mixes it with fuel, burns it and pushes out an exhaust. If it has difficulty with any part of this cycle it won’t run at its best. You should check your air filter each eight hours of use (this might be a single day for you, or over several weeks). If your air filter is dirty you can experience all sorts of issues, most obviously a loss of power. However, long term issues can be increased fuel consumption (so it costs more to run) and increased wear to engine parts (so you have to replace chain saw parts more often). To clean your air filter simply brush it gently with soft brush or, if it’s really bad, wash it in warm, soapy water and then dry it. Be gentle though, if you make holes in it you can let dust/bits get into the engine, which will mean more repairs. If you notice that your saw is low on power, idles poorly or is difficult to start (more so than usual!) you might have an issue with your spark plug. Remove the plug and check whether it’s dirty. If it is then check the air filter, or your carburetor might need adjusting, or you might just be running a bad fuel mixture. Clean the plug and check the gap, then check your air filter is clean. If you’re still having issues and you’re sure your fuel is right then get your carburetor checked by someone qualified. Chances are that your gas chain saw has a two-stroke engine; this means that the lubricants it needs are added to the fuel rather than provided through a crankcase like in a four-stroke vehicle engine. Each saw needs a specific ratio of fuel to oil and you’ll find this information in the manual. This is very important as having an incorrect fuel mix is a quick way to ruin your saw’s engine. Regardless of the type of saw you’ll need to make sure you keep the blade sharp. If you notice the chain chattering or producing sawdust rather than large chips then you’ll want to sharpen it sooner rather than later. If you ignore a dull blade then it becomes a lot more likely that the blade will stick and you’ll experience kick-back which is really dangerous. It is in your best interest to keep your blades as sharp as possible as it will be much safer (which is a little counter intuitive until you think it through). To do this you can simply use a file, or you can buy a commercial chain saw sharpener. There a several chain saw sharpening tools available, including those billed as “automatic”; from the reviews I’ve read I’ve decided to stick to the file. A chain has two types of teeth; cutters and rakers. The cutters actually do the cutting and the rakers control the depth of the cut. The cutters need to be sharp and the rakers will be need to be filed down as the cutters wear. You’ll want two guides for your file (both are pretty cheap tools). The first one sits on top of the cutters and makes sure the file is in the right position. You’ll then need to hold the file at the right angle (check your manual) using the guide. File from inside the cutter to the outside and make sure you are positioned so that this action is away from you (so if you slip you don’t impale yourself with the file!). Do somewhere between 5-10 strokes on each cutter and then check it for sharpness. The second guide sits on the chain links and will hold itself in the correct place and at the correct angle. You then file over the guide to sharpen the cutter. I’d suggest going along one side of the chain, spinning it as you go, then go back along the other side. The height of the rakers needs to be just slightly less than that of the cutters. This difference is really important. Too little and you won’t actually cut anything but too much and the saw will become jumpy (read dangerous!). Every two or three times that you sharpen the cutters you should check the rakers using a depth gauge and then file them off as you need. Now this might all seem too complicated and too much effort. Why not just buy a new saw chain? They’re pretty cheap, right? Well, it depends on your budget. By all means go and check out the prices, but bear in mind that a decent filing job can be done in under 15 minutes (once you’ve had a little practice). In conclusion, if you ignore the needs of your chainsaw then you’re quite quickly going to find you need to buy new parts or an entire new saw. However, if you spend a bit of care and effort at regular intervals, then your saw will look after you for years to come and be much safer to use too!